Despite living in southwestern Ontario for nearly 15 years, we never run out of new places to visit and explore. There is a seemingly endless abundance of villages, towns, and cities that are easily within reach of a weekend trip. To celebrate Ana's birthday we decided to visit Detroit - a place we've never properly been to, besides driving through it (or sailing by it) a few times. We were familiar with the story of Detroit's decades long decay and eventual bankruptcy in 2013 where billions of dollars of debt were written off and thousands of homes were left abandoned and worthless. Well since then, Detroit has been making its comeback. In five years the jobless rate has plummeted, the economy has rocketed forward, and many new people and businesses have set up shop in Detroit. It was definitely time for us to visit. We pulled into Plymouth's downtown and found an elaborately decorated Christmas theme and a string of cool shops, restaurants and taverns, with people everywhere enjoying the evening. 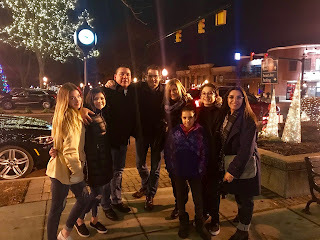 We scored princess parking directly in front of the Pizza e Vino Cellar 849 restaurant where we were to meet some old American friends - Tom and Linda Bondy and their two lovely daughters Lauren and Taylor. We walked in and found them and shared a round of big hugs. Shockingly, 15 years had passed since we last saw them but it sure didn't feel like that long, as they both looked virtually the same. The kids hit it off immediately and soon we were all lost in conversation, trying to catch up on so many years of life. Meeting Tom and Linda was one of those magical moments that happen when you are traveling. Ana and I were sitting in Bob's Banana Bar, located on the island of St. Maarten, circa 2001, when a stocky, clean cut dude sitting at the bar turned to me with outstretched hand and said, "Tom Bondy. Nice to meet you." To say the four of us hit it off immediately is an understatement; we spent the entire weekend together and topped it off with an all-nighter where we ended up drinking and partying all night long and then finally fell asleep on beach chairs at 10 am the following morning. Good times. We woke up early Saturday, had a quick breakfast at our hotel which was near the Deerborn region, and then took off to explore downtown Detroit. Under the cover of darkness there wasn't much to see, but with the ruthless light we were able to see a massive industrial area that we drove through on the way there. Oil refineries, steel plants, and god knows what else combined to produce an elaborate web of buildings, pipes, chimneys, tanks, condensers, platforms, structures and other metallic monstrosities, some releasing smoke, some releasing fire, but all leading you to think it might be a good idea to plug your nose and breathe in a shallow fashion. We soon broke through the industrial wasteland and entered the downtown area which looked much like any other big American city - lots of buildings, cars and people. No gangs, no fighting, no street lurkers, no shady dudes with jacks and tire irons waiting for you to park your car, and no Robocops blowing away criminals. In fact, we didn't even see a single police car. The mental map of Detroit was far, far from reality and all the tips my friends had given me on how to avoid getting mugged there were going to be of no use at all. Our first destination was the Detroit Institute of Art, housed in a glorious and grand old building, one of many we saw that were undoubtedly the result of the massive amounts of wealth generated in this city during its heyday, and the philanthropic barons who channeled their money into worthy causes. The gallery was simply amazing, and in two hours we were able to get through only a fraction of it. One of the highlights was definitely the Detroit Industry Murals, a series of massive frescoes painted by the Mexican artist Diego Rivera in the 30's. Another was the self-portrait done by Vincent Van Gogh, a painting nearly anybody would recognize. Ana remembered that during the depth of the financial crisis when Detroit was at its worst, the city was planning on selling off a substantial portion of their art collection, to fund the massive budget shortfalls. Fortunately, groups of philanthropists stepped in and saved the city from this cultural heart punch. We next visited the main branch of the Detroit Public Library, which is located directly across the street in another grandiose building. We had a quick look around, but everybody was getting hungry, so we returned to our vehicle for a snack from the cooler (leftover pizza from the night before), but I remembered passing a Slow's to Go BBQ restaurant so we stopped by there and ordered a Triple Threat sandwich (pulled pork, ham, bacon) and a big side of mac and cheese and shared it while we watched a bit of the football game between the University of Michigan Wolverines and the Ohio State University Buckeyes, one of the greatest rivalries in college sports in the US. Well over a hundred thousand people regularly attend these games, proving the most popular religion in the US is the Church of Football. In my college days the football games were attended by a sprinkling of people, bundled up in clothes and blankets, freezing to death, watching the players running around in snow up to their ankles. The afternoon was spent simply walking around downtown - checking out the shops, people watching, taking photographs. On one street corner was a group of 7 or 8 black men, all holding bibles and taking turns reading passages to each other and to any passersby who wanted to stop and listen. Nearby, we found a large public area which had been transformed into a Christmas wonderland. There was a large skating rink full of adults and kids, all bundled up and having fun zipping around on the ice. Across the street from this was a village of small, glassed-in shops resembling mini-greenhouses, each which held a single vendor selling some sort of knick-knackery. The entire area was decorated with Christmas trees and outdoor seating. The village led to another greenhouse style building, and is what I would call "Cozyland". 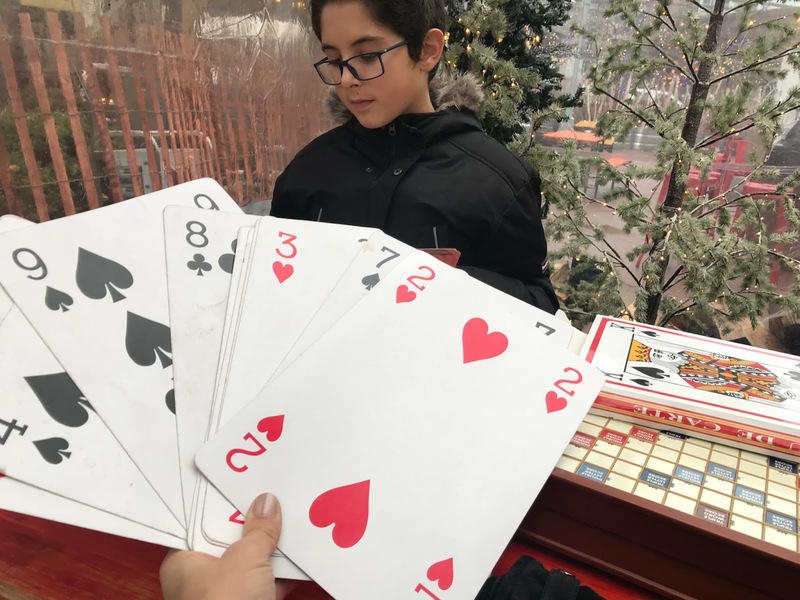 It looked like a series of family living rooms, complete with big comfy couches, leather recliners, area carpets, coffee tables, and within each section was a game - giant playing cards, Jenga, Monopoly, Connect-Four, and a dozen others. In the centre was a counter where you could buy alcoholic drinks, hot chocolate, tea or coffee. Gentle Christmas music streamed as people crammed the couches, playing games, laughing, and having a great time. The whole scene was very jolly indeed, but unfortunately it was so packed we couldn't find a place for us all to sit so we just wandered around for a while and then returned to our car to head to the malls. Yes, there is really no way getting around it - when you go to the US you have to shop. This is why I always keep reading material in the car. When the wife and kids go bargain hunting, I choose to remain in the van, listening to tunes and catching up on reading, which is most enjoyable. I did go into Target though, to pick up a cheap case of beer - the only type of shopping I actually enjoy. We had a lovely meal at the Olive Garden restaurant and gave Ana her birthday cards and what could possibly be the worst gift ever: two $25 gift cards for the Olive Garden, purchased only minutes before, which took care of most of the dinner bill. It's a good thing my wife has an outstanding sense of humour. It was still early in the night so we returned to the Greektown area of the city centre and found ourselves a window seat at one of the many bars. Since arriving we'd noticed a proliferation of electric scooters zipping around the city and as we enjoyed our drinks we saw many more passing by, now mostly piloted by intoxicated people. Magnus was determined to rent one to try it out, but we persuaded him to wait until the next day as the idea of him going head to head with drunks on fast moving scooters was unsettling. Sunday morning arrived, we wished Ana a happy birthday, had breakfast, and then took off for Aldi to do some grocery shopping. This is one of our standard stops on trips to the US as we can stock up on items that are outrageously cheap, such as gallon jugs of milk for a dollar, cartons of eggs for 50 cents, and blocks of cheese for a third of what we pay at home. 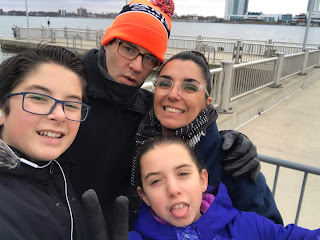 Like magnets, we were drawn back downtown, but this time we drove directly to the Detroit International Riverfront area which is a 9 kilometer stretch of pathways, shops, parks, and docks right along the Detroit River. Here we found a giant amphitheatre, a carousel, a lovely pathway featuring weather-proof works of art (Ana's taking this idea home with her), and the massive General Motors Renaissance Center - a series of seven interconnected skyscrapers that serves as the world headquarters for General Motors, as well as a Marriot hotel and who knows what else. GM has an amazing car display inside the building, which is publicly accessible and features vehicles both old and new. It was eerily quiet inside the giant building, but I've read there are over 10,000 people who work in these building so I'm sure it's a much different scene during the week. In front of the Renaissance Center was a massive flat concourse perfect for scootering, so Ana downloaded the app and rented one of the electric scooters parked outside. There are actually three companies that provide scooters in Detroit. You download their app, scan the bar code on the scooter you want, which turns it on and then charges you a buck for every 30 minutes you use it. When you are done, you simply park it on a sidewalk anywhere you want. Magnus jumped on the scooter and in a flash he was off! They motor along at an impressive clip and each of us took a turn on it, which was great fun. It was lunch time so we took my brother-in-law Mark's recommendation and ate at the American Coney Island Chili Dog restaurant (A Family Owned Detroit Original Since 1917). A round of chili dogs and chili cheese fries for the team sorted out the hunger issue. From here we explored a few more of the shops downtown and then walked over to the nearest stop of the People Mover - a fully automated and driverless train that encircles the core downtown area. The full route is only about three miles long and we rode the entire circuit which took just over 20 minutes. The train runs along a raised bridge, giving you a terrific view over all the streets and buildings, and is a great way to get your bearings and understand out the downtown layout. I imaging this comes in very handy on those -20 January days when it gets uncomfortably cold to walk. To finish off our weekend trip to Detroit we picked up another scooter and took turns racing it around an empty parking lot, performing high speed stunts and bombastic maneuvers of all sorts. Even Stella, the most cautious of drivers, wound it up to full speed for a brief moment, but terrified herself so hit the brakes and slowed it down to granny pace. With that, we jumped in the van and drove back to Canada through the tunnel which runs beneath the Detroit River and pops out in downtown Windsor - yet another city we have never properly explored. So many options, so few weekends!